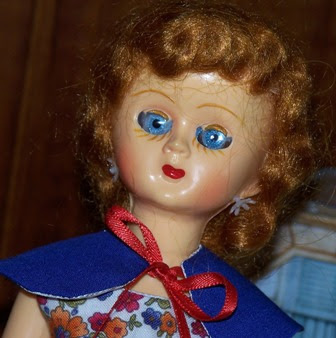 I received my copy of British Dolls of the 1950's by Susan Brewer in the mail today and was elated to see on page 94 a picture of a doll nearly identical to my one. Due to copyright, I can't show you a picture here of the doll in the book, but the earrings are the same and her hair, blush and mouth are nearly identical. Unfortunately there is only a head and shoulders shot in the book. The mystery as to my doll's identity is not quite solved as the mark on the back of the doll in the book is UP and the mark on mine is as follows; Made in Hong Kong (British Empire) No. 8110. Beneath this are the letters W P W inside a diamond shape which is kind of on it's side. There are 2 arrows pointing out of the diamond shape, one on each side. My guess is that there was a manufacturer that made these dolls for various companies who just had to put their stamp on the back of the doll and perhaps specify things like hair and eye colour. Like mine, the UP dolls were also made in Hong Kong. The author writes that these dolls were very popular in the 1950s. She thinks they were probably sold at small toyshops and markets. 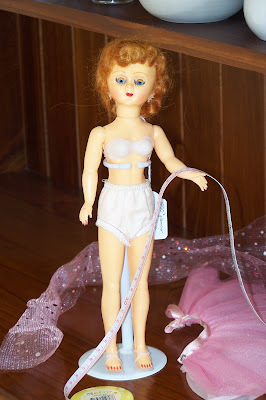 The dolls came with a plastic bra and silky pants ready to be dressed at home. I think all of this fits in with my doll, although I would like to find out a bit more about the W P W company. If anyone out there knows anything, I would really like to hear from you. I bought a little toddler doll with Made in England stamped on her back at a doll fair a couple of weeks ago, so I thought it was about time to delve into the British doll making scene and buy a reference book on the topic. I think Susan Brewer's book is wonderful for reading about the history of individual manufacturers, but it does not have the number of pictures that some of my reference books on American vintage dolls have. It is still a worthwhile addition to my collection though. My sewing has slowed down with Christmas around the corner, but I am just sewing up the hems on my bargain Coles supermarket wide leg trousers. I was going to take some of the width out (as well as the 5 inches I had to take off the hems), but thought what the heck, I will wear something a bit different and leave them wide.